Luke Donald moves to #1 in the world rankings. Is there an echo echoing the echo in here? 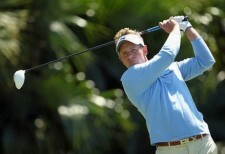 Luke Donald successfully defended his title at the European Tour’s BMW Championship this past weekend at Wentworth Club. With the victory Luke moves to #1 in the world rankings for the fourth time. The victory also puts Donald into #1 in the European Tour’s Race To Dubai points. Rory McIlory moves to #2 while Tiger Woods barely stays in the top 10 by just one world ranking point.